PCTPA Bikeway Updates | Kittelson & Associates, Inc. 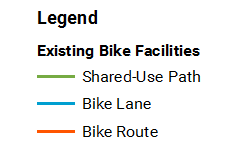 Please help us identify locations where our regional bikeway dataset does not reflect your jurisdiction's existing bikeway facilities. For more information on the bikeway planning process, please visit the Placer County Regional Bikeway Plan Update project website. Having trouble viewing or using the map? Please contact Aaron Hoyt at ahoyt@pctpa.net with your comments. Note: To change the basemap, select your preferred basemap in the top left corner of the map.